Five-star reviews on Facebook and Powder Hounds! Japan is a long ways to come to only ski. With this tour, skiing and sightseeing aren't mutually exclusive. This exciting 2-week trip combines the absolute best skiing/riding in Japan with the absolute best sight-seeing. We base our ski operations out of 3 well known areas--Niseko, Hakuba*, and the lesser known gem of Asahikawa in central Hokkaido. We also see the best sights in Tokyo including a boat cruise around Tokyo bay, Shamisen performance (traditional instrument), a 500 year old tea house, and the Tsukiji fish market, all guided by your English speaking bilingual guide. In Kyoto we get on bikes and ride around to all the best temples, shrines, back alleys and Geisha hangouts that Kyoto has to offer. We do all this while staying in top-notch hotels and following your ski guide* to the best possible off-piste powder (lift-accessed back-country) on any given day! *Hakuba portion (2 ski days) does not include a ski guide. All of your ski logistics including transfers to and from ski hill, purchasing of lift tickets etc. are taken care of by your bilingual tour facilitator. Want to see how the Renaissance Rider compares to our other ski trips? Check out the ski trip comparison page here. On the 5 ski days in Hokkaido, your ski guide will be taking guests to off-piste/side-country areas about 70% of the time. The other 30% of the time, you'll be skiing groomers to access the off-piste (weather/conditions permitting). If you are interested in going with the guide, you must be an advanced-expert skier/rider capable of riding deep powder and have the necessary avalanche equipment which can also be rented. Strong intermediates are also welcome on the Storm Chaser but some of places the guide will take guests may be above your level, in which case you'll be asked to stay to the groomers and meet at lunch or the end of the day. 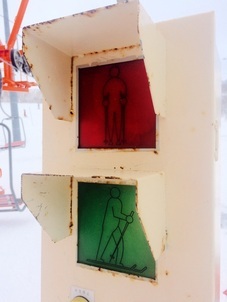 Important Note: The 3 ski days in Hakuba are facilitated by a bilingual guide, but will not include a ski guide. On each day in Hakuba all of your ski logistics are arranged from being driven to and from any given ski resort, lift tickets purchased and resort maps provided by your tour guide. More details on skier experience level can be found here. Your experienced ski guide will give a resort orientation which will show you the best possible pow-stashes in-bounds (Hokkaido portion). For advanced riders with avalanche gear, the guide will also go off-piste to show you the best kept secrets just off the groomers (Hokkaido portion). Don't lug your things around. Instead of dealing with dragging your things through stations and trains, we mail all our large ski bags to our destination before we get there (included). Experience the spiritual center of Japan’s old capital in Kyoto including the 1,000+ year old Kiyomizu dera, Ginkakuji’s (silver pavilion) world renowned zen garden, and Japan’s top rated sightseeing spot, the Fushimi Inarai Taisha. Spot Geisha walking down the cobblestone alleys of Kyoto’s Gion District on an included Kyoto tour. Stay in 3-4 star accommodation ranging from Western style to Japanese traditional Ryokan. Further details on accommodation here. Soak yourself in natural hot springs every night when we're in Hakuba, Niseko & Asahikawa (9 nights) using the on-site indoor and outdoor baths. Not into hot springs bathing in public? No problem, each of our rooms has private showers as well. Ski the site of the 1998 Winter Olympics at Nagano’s famous Hakuba resort. Six resorts in one, this town offers Japan’s best big-mountain skiing terrain (ski guide not included). Experience the best of Tokyo including a tour of the Tsukiji fish market, Senso-ji temple in Asakusa, a river boat cruise as well visiting a 1,000 year old traditional tea house in the center of Tokyo. 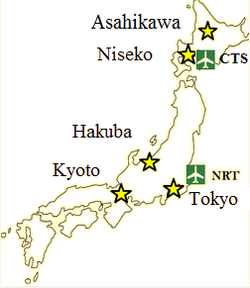 Note that this trip is ski guided for the 7-day Hokkaido portion only. The two days of skiing in Nagano will not come with a ski guide, although you will have an English speaking facilitator. To see more details and pictures, check out our Itinerary page. ​How does the Renaissance Rider compare to our other trips? Check out or trip comparison page.